Stories can be told in many ways: oral, written, and visual being three of the most common. Indeed, a picture is often worth a thousand words -- or in the case of Linda Laino, way more. 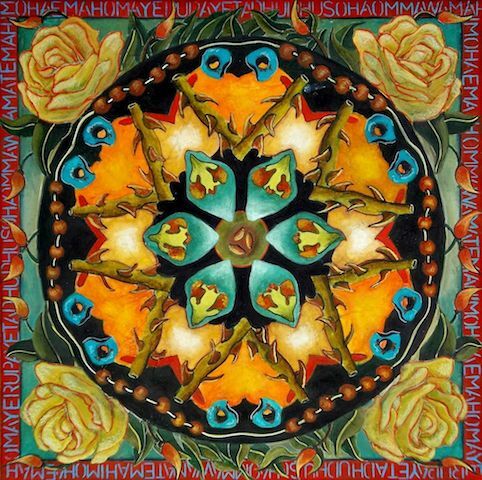 A giclee of the Mandala above can be yours for just $10 if you enter (and win) Linda Laino's super cool raffle, just launched today. The drawing will be on April 9th. All you need to do is go to PayPal.com, enter Linda's email address (lalaino@yahoo.com), and pay $10. Simple. PS: The mandala she is raffling off retails for $175. Support the arts (and the artists who make the art). Give yourself a chance to win a beautiful piece of art!